Mickey Jones, a character actor who appeared in shows including “Justified” and “Home Improvement,” died Wednesday from the “effects of a long illness,” his publicist confirmed to Variety. He was 76. Jones’ multi-decade career began in 1971 on the TV comedy “Rollin’ on the River.” He appeared in dozens of television shows and movies, notably alongside Arnold Schwarzenegger and Sharon Stone in 1990’s “Total Recall.” In addition to a recurring role as Rodney “Hot Rod” Dunham on FX’s “Justified,” Jones was also known for his work on “Home Improvement,” where he played Pete Bilker, a friend of Tim Allen’s character, from 1991 to 1999. Jones most recently worked on J.K. Simmons’s comedy “Growing Up Fisher” and “Newsreaders,” which starred Kumail Nanjiani. Give it up to Pat Savage for writing this excellent bio for Mikey Jones. Mickey Jones (born June 10, 1941) is an American musician and actor. His career as a drummer had him backing up such artists and bands as Trini Lopez, Johnny Rivers, Bob Dylan, and The First Edition with Kenny Rogers. Jones has seventeen gold records from his musical career of over two decades. After the break-up of The First Edition in 1976, Jones concentrated on his career as a character actor, where he has made many appearances on film and television. 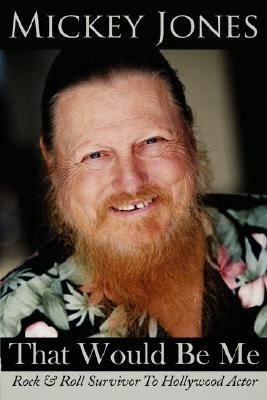 Mickey Jones was born on June 10, 1941, in Houston, Texas, to Fred Edward Jones, a U.S. Naval Officer, and Frances Marie (née Vieregge) Jones, a homemaker. His sister Cheryl Marie died in 2006. Jones attended Sunset High School in Oak Cliff, a suburb of Dallas. It was during this time that he obtained and learned to play his first set of drums. After sitting in with several local bands, Jones and four schoolmates formed their own band called The Catalinas. 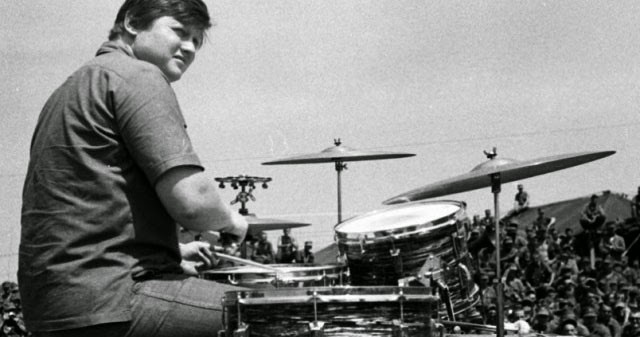 Although the band saw some local success, he was replaced by a new drummer as Jones was only sixteen at the time, and the band wanted someone who was of legal age. After working as a freelance drummer with various acts, Jones was introduced to Trini Lopez. When Lopez’s drummer became ill, he was asked to take his place and eventually became the band’s new permanent drummer. In 1959, Jones left Lopez’s band to pursue a degree in Business Administration at North Texas State College (now The University of North Texas). After college, he took a job at Rohr Aircraft in San Diego, California. Seeing that the life of a factory worker was not for him, Jones moved to Los Angeles to get back into the entertainment industry. He landed a job as a page at the NBC studios, while re-establishing his friendship with Lopez, who had moved to L.A. as well. Jones would again become Lopez’s drummer, while Lopez would see much success with hits such as “If I Had A Hammer”, “La Bamba” and “America”. In 1964, Jones left Lopez’s band to join Johnny Rivers (“Secret Agent Man”, “Memphis” and “Mountain of Love”) as his drummer. During this time, he traveled with Rivers’ band, along with singer Ann Margaret, to entertain the troops in Vietnam. In 1966, Jones was made an offer by Bob Dylan to join him as his drummer. Replacing Levon Helm, Jones would accompany Dylan with the other members of what would become The Band, on his world tour of Australia and Europe. 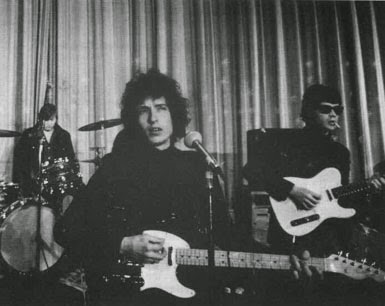 It was during this tour while performing at the Manchester Free Trade Hall in England on May 17, 1966, that the audience jeered Dylan for attempting to play an electric guitar during the latter half of the show. 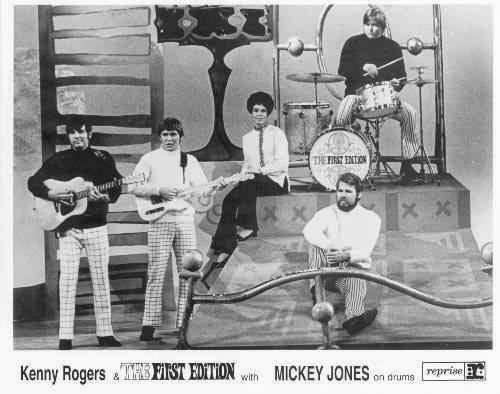 Promotional photo of The First Edition with Jones on drums (Kenny Rogers, lower right). Jones’s career with Bob Dylan would be cut short when Dylan had to temporarily stop performing in order to recover from a motorcycle accident. At this time, Mickey had decided to pursue a career in acting. He had landed jobs as an extra, when in 1967 he was approached to be the drummer for a new group called The First Edition, with lead singer Kenny Rogers. With hits such as “Something’s Burning”, “Ruby, Don’t Take Your Love To Town” and “Just Dropped In (To See What Condition My Condition Was In)”, The First Edition would see much success over the next ten years, even having their own TV variety show, “Rollin’ on the River” (later shortened to “Rollin'”), in the early 1970s. In 2009, Jones published his autobiography “That Would Be Me”, the title based on the catchphrase often used by his character on “Home Improvement”. Biker Mickey Jones got on his first motorcycle in Dallas in 1958. It was a friend’s bike. He was on the road just a few minutes when it began raining. “The light turned red, and I laid it down and slid through the intersection,” he says. “I had two choices. I could never get on that thing again. Or I could get it back to my friend and pay for his foot pedal. Motorcycles are key to the second half of Jones’ career. Since he walked away from the music business in 1976, he’s been cast regularly in biker roles, partially due to his bulk, partially due to the fact Jones prides himself on always knowing his lines and hitting his marks. When he’s in a scene on a bike, he’s in the scene onthe bike. 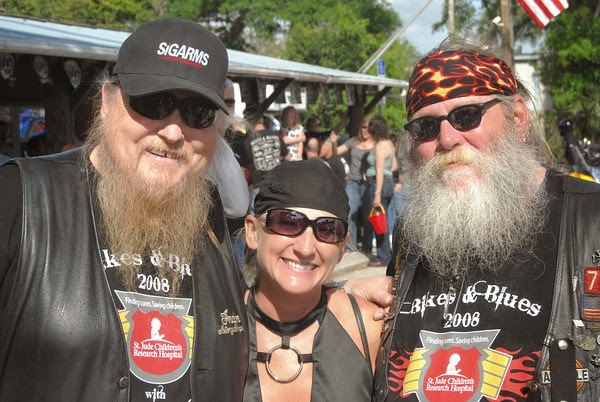 “So often an actor playing a biker doesn’t ride, but with me, they can shoot the gang coming. I’m usually out there in the lead with a trail of stunt people behind me.” film and television. Mickey was officially sponsored and endorsed Indian Motorcycles for a number of years. Jones lives with his wife in Simi Valley, a 40-minute drive from Los Angeles. He recently shot a pilot (he plays a veteran biker, naturally) for HBO, though there’s no word yet about whether it’ll air. He also runs a video-editing company, putting together reels for actors. Because he’s done so much work, residuals trickle in all the time. He mentions a TV commercial that used Secret Agent Man. “We were just about to inquire about that one and the next day a check showed up for $1,500,” he says.